Laz Versalles recently vowed to get back into shape. A former college football player, Versalles still looked strong, but with marriage and fatherhood, he’d put on some extra pounds. Versalles wasn’t just interested in looking better, he also wanted to improve his health. One of the perks of his job at Accesa Labs is regular blood testing, and his initial screening revealed some unexpected problems. Versalles knew that if he wanted to avoid a prescription, he had to clean up his diet, so he began eliminating clear offenders, like sugar and simple carbs. Soon, he eliminated everything, except water, from most of his day. 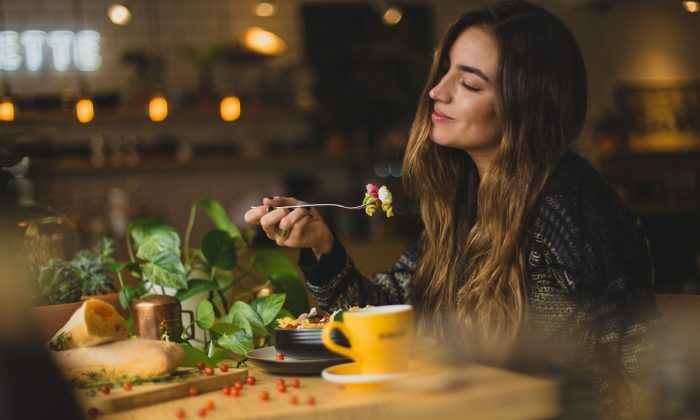 This eating style is called intermittent fasting (IF), or time-restricted eating, and interest in it has been growing steadily over the past decade. You can’t quite call it a diet, because it’s not about counting calories or avoiding specific foods. Instead, the focus is on how often you eat. Track the snacks, drinks, and meals of the average American over 24 hours, and you’ll find they feed within a 15-hour window. This means that if you eat breakfast is at 7 a.m., you’re likely still nibbling by 10 p.m. IF aims to shrink this eating window, by a few hours or even a few days. In an era of 24-hour drive-thrus, plentiful snacks, and constant cues to stuff our face, IF works to impose a boundary around your eating time. Why would we want to constrain our freedom to eat whenever we’d like? Because traditional boundaries have dissolved. In 1977, eating opportunities (meals and snacks combined) averaged three per day. By 2003, that figure had grown to about six per day. Emerging science finds that eating as often as we currently do could be negatively impacting our health. One of the most influential researchers with regard to IF is biologist Satchidananda Panda of the Salk Institute. In 2012, Panda’s team examined the eating patterns of two groups of mice: one had unlimited access to food, the other had its feeding time restricted to eight hours a day. Both groups consumed the same fat- and sugar-rich diet, but the mice that ate whenever they wanted became obese and sick, while the time-restricted mice didn’t. Animal studies don’t always reflect what will happen in people, but a study done with human subjects published earlier this year reveals a common theme: a group of prediabetic men was fed during a 12-hour daily window for five weeks. Later, they were fed the same meals but restricted to a six-hour window. The more restricted eating time resulted in improved insulin sensitivity, reduced levels of oxidative stress, and produced a 10-point drop in blood pressure. It’s also been successful for Versalles. Since he started IF, he’s lost 16 pounds and two inches off his waist. He says he has more energy, can think clearer, and his golf game has made noticeable improvements. His blood work has shown improvement, too. After just a couple of months, Versalles says his 46-year-old body now feels 26. “It’s really changed the way I look at food,” he said. If fasting sounds like a bad idea, you’re not alone. When Versalles first asked his doctor about doing a seven-day fast, his doctor told him it was foolish. Yet, fasting has been used as a means of physical and spiritual purification since the dawn of civilization. And up until the beginning of the 20th century, fasting had been considered a reliable treatment for various illnesses. New research reveals verifiable benefits, making it harder than ever to dismiss fasting’s health potential. Studies have shown that fasting for two days or more may reduce inflammation, improve immune function, and decrease the risk of neurodegenerative diseases like Alzheimer’s. This has inspired the 5:2 method of IF where people eat regularly for five days and then don’t eat for two. But are these benefits a unique feature of fasting, or just the product of eating less? According to Suzanne Dixon, registered dietitian with The Mesothelioma Center, the same results may be achieved by consuming smaller portions in a regular eating schedule. She cites a year-long trial comparing alternate day fasting (eat one day, don’t eat the next) with regular dieting (daily calorie restriction), that found no significant differences in terms of weight loss, blood pressure, heart rate, triglycerides, insulin resistance, and more. While Dixon isn’t against fasting, she does caution that the longer we go without eating, the more discipline we need to keep from bingeing once food is back on the table. “My observation, personally (after doing a few five-day, water-only fasts over the past couple of years) and in working with dieting clients, is this: The person who can fast aggressively and not overeat when the fast ends is rare indeed,” Dixon said. The longer you go without food, the greater the temptation becomes to gorge yourself once the fast is finished. But binging can easily diminish all the health benefits from a long fast, since binge eating is a reliable way to raise cholesterol and worsen insulin resistance. We all fast when we sleep (unless you raid the fridge several times a night), and break our fast with the first meal of the day. This regular period of non-eating serves very important biological functions: It gives our hardworking digestive organs a break and brings our hormones and lipid levels down to baseline. This is why doctors sometimes require a fasting blood test: so they can see how your body works when it’s not under the influence of digestion. If we can regularly extend our non-eating time by just a bit (say 12 hours instead of the usual nine), we may be able to impact our health in a positive way without triggering a binge. Toronto-based kidney specialist Dr. Jason Fung, the author of “The Complete Guide to Fasting,” became a strong advocate of IF by virtue of his clinical experience. The majority of Fung’s patients are diabetic. Like most doctors who treat diabetes, Fung previously focused on insulin prescriptions. Today, he encourages his patients to try IF. Fung’s change of heart came as he considered the nature of insulin as a fat-storage hormone, and the vicious cycle that giving more of it can create. Our pancreas produces insulin when we eat. This hormone helps guide nutrition into our cells for energy. If we eat more than we need, insulin signals our body to store some of this food energy as fat for later use. In Type 2 diabetes, patients typically make more than enough insulin—so much, in fact, that the cells become insulin resistant, resulting in high blood sugar because the nutrition can’t enter the cells. Injections temporarily fix this problem by flooding the system with insulin, essentially forcing resistant cells to ingest what we eat. Eventually, cells become resistant to this new level of insulin, demanding that the dose is raised to keep blood sugar from surging. In a world of culinary excess, our body’s natural fat storage process—which helped our ancestors survive famine for thousands of years—has become a scourge. Carbohydrates (especially the really sweet ones) surge our insulin the most. But every time we consume any calories, we get an insulin spike. Fasting accomplishes two goals: It drops our insulin level to baseline, allowing previously resistant cells to become sensitive to the hormone again. And, since there are no incoming calories, our body begins to mine fat stores for energy. Fung gives no hard rule on how often to fast, since individual physiology and schedules can vary so widely. But, like Dixon, Fung says that patients are typically better off restricting their eating window rather than forcing themselves through long bouts without food. Children, pregnant women, and those with eating disorders are discouraged from fasting. But for most of the rest of us, Fung suggests a daily 16-hour fast. He says it’s relatively painless because a majority of this time is spent sleeping. However, if you’re accustomed to evening treats or cocktails, even a slightly smaller feeding window may still seem like a sacrifice at first. Not only will you feel hungry, but it can also be awkward to face an empty plate when everyone around you is chowing down. People report that the first few days on IF are the most difficult since our habits and hunger hormones take time to adjust. But we can manipulate two big factors to make it easier. The first is time. IF is about setting boundaries, but where you draw them in your day is up to you. For 16-hour fasters who already prefer to skip breakfast and want to eat dinner with their families, a noon-to-7 p.m. window might be a good fit. Another factor under your control is what you eat. Fung recommends a low-carbohydrate diet for his patients, but any generally healthy diet restricted by a smaller window of time can lead to fat loss. However, in order for it to work, most of our food choices must be reasonable. According to Jake Dermer, a corporate wellness consultant and certified personal trainer, there are limits to the power of IF. “If you fast all day and then eat pizza and donuts all night, you’ll still gain weight,” he said. As far as sustainability, Dermer has many clients who have successfully used IF for years. Fung believes people do best when they understand their bodies and their tolerances. While smaller eating windows produce faster results, they also require more discipline. Thankfully, it’s not a race, and most experts agree that slower weight loss is more likely to stick. If you’ve previously given your appetite free reign, you can still make progress with a modest boundary.